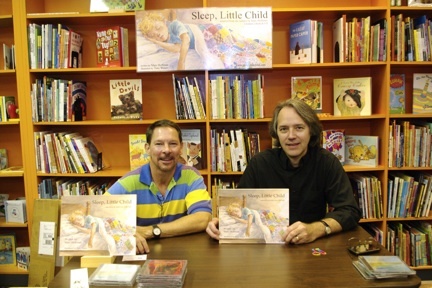 L-R: Illustrator Tony Waters and author/musician Marc Hoffman with "Sleep, Little Child." October 6, 2010 (CHARLESTON, SC) – Blue Bicycle Books on King Street in Charleston will host a special book signing on Saturday, October 23, at 11 a.m. featuring North Carolina author/musician Marc Hoffman and illustrator Tony Waters of Charleston as they present their new children’s book and CD, Sleep, Little Child. Along with a reading of the book and signing copies afterwards, Hoffman will perform the original lullaby on which the book is based. Refreshments will be included. The event is free and parents are encouraged to bring their children. The first 20 children in attendance will receive a coloring page and Crayola give-away. Sleep, Little Child is a rhyming story in which a father assures his young son that he will sleep safely through the night because his heavenly Father is always watching over him. The book is intended for children from infancy through age seven and includes a CD that features Hoffman singing the title lullaby. 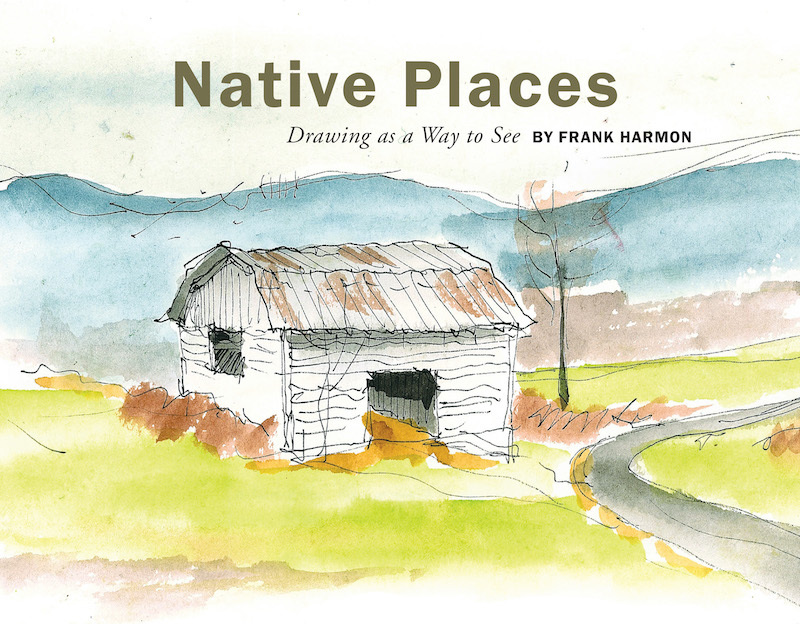 Other tracks offer the instrumental-only version and a read-along track, plus two non-musical readings: one by the author and another by the author’s mother, radio personality Barbara Hoffman. Born and raised in Charleston, Tony Waters has written and illustrated three children’s books of his own, illustrated four Flick books for Columbia, SC, author Lynn Floyd Wright, and contributed numerous illustrations for the Cricket Magazine Group over the past 16 years. Prior to the bookstore event, he will appear on ABC News 4’s “Lowcountry Live!” show (WCIV-TV) on October 21, at 10 a.m. to discuss Sleep, Little Child. Author Marc Hoffman is best known as a composer, performer and recording artist who recently released an all-original jazz compilation CD entitled “Curioso.” He credits his wife, Anne, and their young daughter, August, with the inspiration to turn his lullaby into a book. For more information on the Sleep, Little Child and to hear the lullaby, visit www.sleeplittlechild.com. 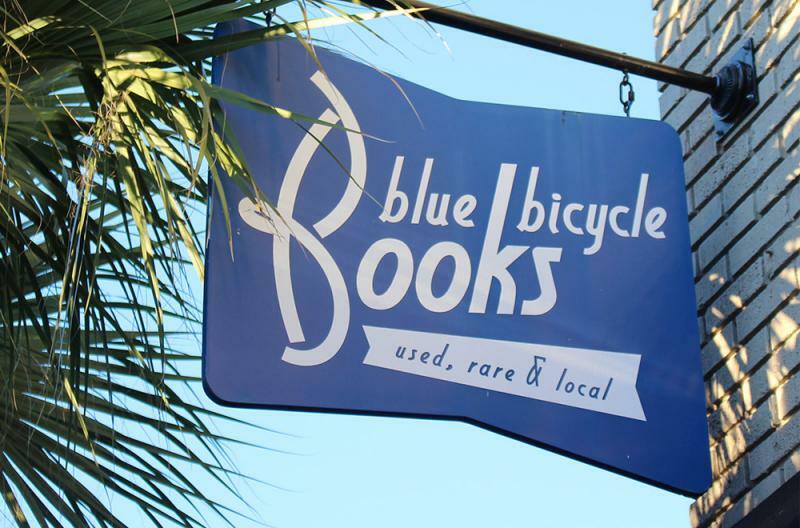 Blue Bicycle Books, voted Charleston’s best used book store five years in a row, is located 420 King Street, Charleston, SC, 29403. For more information, go to http://bluebicyclebooks.com. Synopsis: As babies grow into little children, there comes a time when they realize that, like themselves, Mommy and Daddy sleep at night, too. Where, then, is the watchful eye to look over them all night? Where are the protective arms to keep them safe when they close their eyes and drift away into dreams? Sleep, Little Child answers these questions with simple verse, soft music, and compelling illustrations. 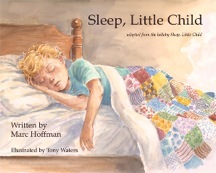 Composed and sung by Marc Hoffman and illustrated by Tony Waters, Sleep, Little Child is a lullaby with a comforting message: that Someone strong, loving and more powerful than even Mommy and Daddy is right there with all little children, keeping them safe and warm, and greeting them with the morning light. Publisher: Virillion Music. Retail price: $17.95. www.sleeplittlechild.com.